Why do people buy vintage/period/original clothing, as opposed to buying retro or repro? I know there are many reasons: It’s a thing from being part of a music scene; the quality & fit are often better; it’s a way to look unique; you can buy designer quality garments at affordable prices; for ethical reasons of recycling and so on but for some folk, I know that part of the reason is that they are fascinated by the thought of buying and wearing a piece of history. 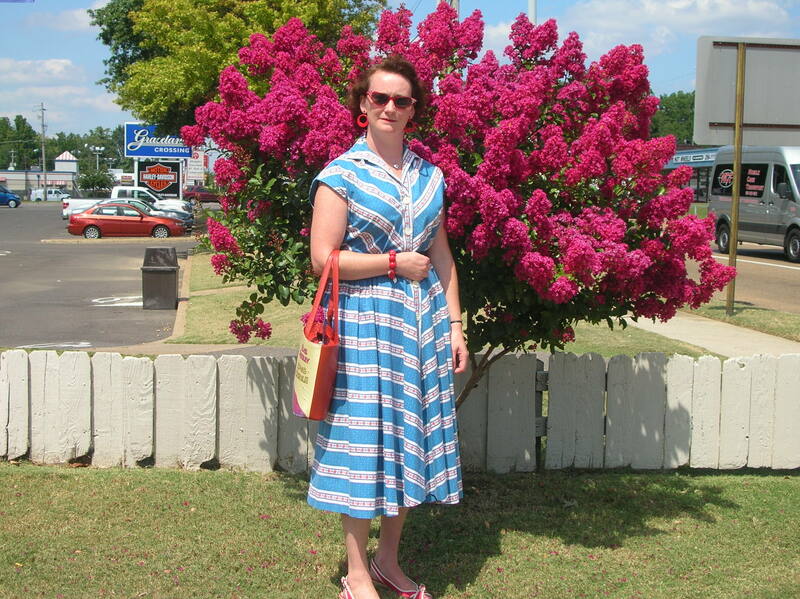 I previously wrote about one of my favourite dresses, commenting on it’s durability in that it would have been a good 30 years old when I bought it buttonless from a junk stall at a fleamarket with a good few adventures behind it, and it’s had another almost 30 years of adventure with me at dances, events & on holidays and the same could be said about much of my wardrobe. I have always appreciated the idea of something having actually existed in the period of time that I’m interested in – even as a young teenager I knew that the original 1950s Buddy Holly LP was still worth buying even though I had a repress that was an exact copy, and I was so excited to play it and know that that very record had most likely been played by someone around my age actually in the 1950s!! That kind of thing has always meant a lot me. That’s also why we leave names written in biro on old record sleeves rather than carefully cleaning them – I would rather think about who ‘Brenda Jones’ was & what she looked like, & what she wore when she bought that Bobby Vee EP than worry about my record being pristine. Around a year and a half ago, I got a call from someone who had been put in touch with me as he had a load of old clothing that he thought might be of value. It turned out that his Dad had recently passed away & had also kept lots of things belonging to his Mum who had passed away a while ago. There was a tight deadline on clearing the house, so this guy could very well have saved himself some stress & chucked it all in a skip but he obviously has a mind like mine & really wanted the things that his parents had kept & valued for so long to live on & be appreciated by someone else. 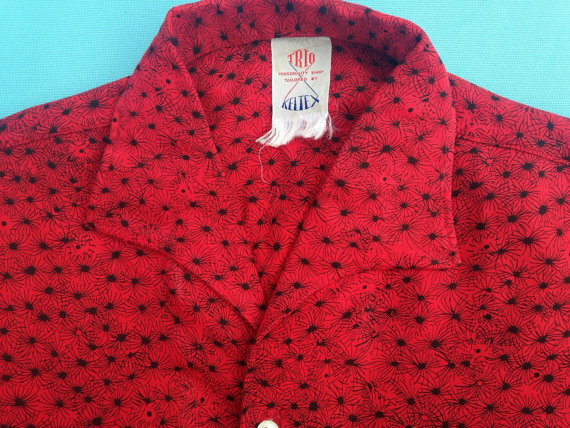 Within that batch of clothing was a lovely atomic print 1950s shirt in a great shade of red, that needed a good wash & air and just a little attention with a needle and thread.